Are you in the market for a new smartphone? Well this is the time of the year where a lot of new smartphones have been released that are all advertised to make your life easier with smart features that will make your smartphone your top used gadget, even more than your PC. 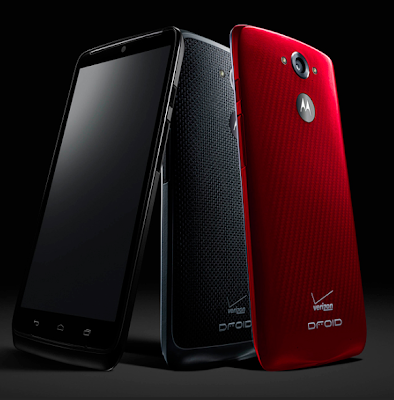 And the Droid Turbo powered by Verizon Wireless is the newest smartphone released by Motorola that has features that will definitely make your life easier and make your smartphone the smartest device that you own. I have been reviewing the Droid Turbo for the past 2 weeks and have found so many things that I love about the phone that it is hard to list just a few for this blog post. I remember when 16GB was a massive amount of storage on a smartphone, but not anymore. My 16GB smartphone is totally filled with photos, videos, and hundreds of apps - and that is after I cleaned up the storage and moved most of my videos and photos to Dropbox! So I love that the Droid Turbo comes standard with 32GB of storage for the same price that 16GB Droid models were going for last year. As we use our smartphones more, we definitely need more storage and the Droid Turbo can meet that need with its 32GB and 64GB models. We have all been there. A perfect camera shot is coming up and you know you are going to miss it if you have to open your smartphone and then navigate to the camera. But you don't have to worry about missing a shot with the Droid Turbo. Just shake the smartphone twice and the camera wakes up - even if your phone is locked. How cool is that? And the Droid Turbo has a 21-megapixel rear-facing camera that can record and play back video in 4K so your home videos will look more professional than ever before. I think most of us charge our smartphones every night since the battery is probably near dead or completely dead by the time we go to sleep. My smartphone has a 2100mAh battery and it just does not last since I am using my smartphone constantly. So I always keep a portable charger in my purse and a charging brick at work to make sure that my smartphone battery makes it through the day. 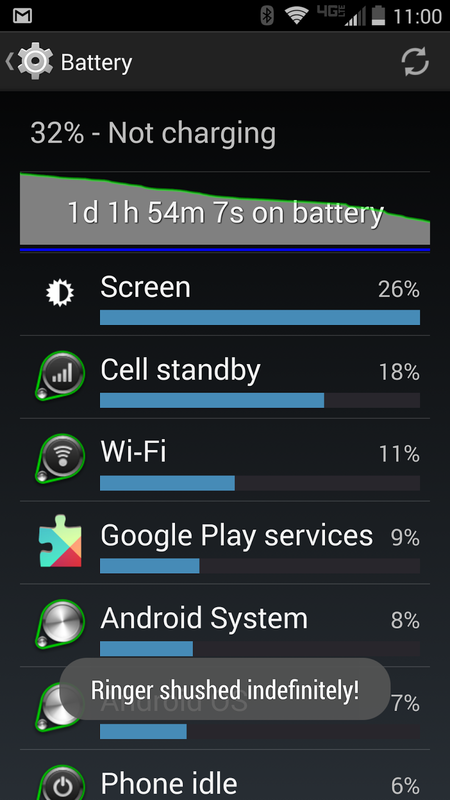 Well with the Droid Turbo, all that battery drama is a thing of the past. The Droid Turbo packs a 3900mAh battery that will easily get you through the entire day with some power to spare for the next day. I cannot tell you how wonderful it was to use this smartphone and know that I did not have to worry costantly about charging the battery. 4. A Big Beautiful Screen makes everything look wonderful! I wish I could take a photo to show how beautiful the Droid Turbo screen is, but I cannot capture in photos how awesome this display looks. I put the Droid Turbo next to my smartphone and I could easily see how the colors were deeper and more saturated. And when you pair the Droid Turbo's Quad HD display with the 5.2" size, you get a great user experience that makes everything that is displayed on the screen easy to see and great to view. 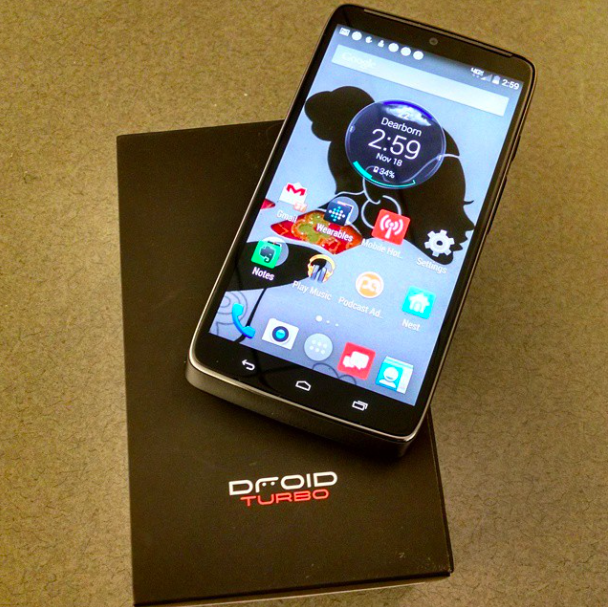 Every smartphone should have a Turbo Charger like the Droid Turbo! 5. Turbo Charger to the Rescue! I think everyone has at least once forgot to charge their smartphone before the have to go to an event. So what do you do if your smartphone is on 5% and you have to leave the house in 15 minutes? Well if you have a Droid Turbo, you just charge the phone using the Turbo Charger and you will add about 6 hours of additional power to your smartphone - Can we make this standard issue on all smartphones? Active Display puts all your notifications on the lock screen for easy access! 6. Active Display and Touchless Control are like having your own butler! 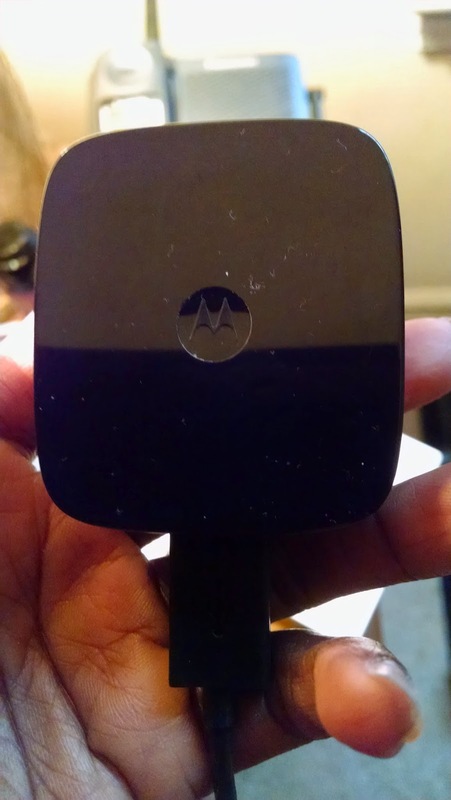 I was first introduced to active display and touch less control features when I reviewed the Motorola Moto X and the Motorola Droid Ultra smartphones - and I totally love these features. Active Display allow you to to preview alerts on the lock screen with just a touch of the screen so that you know in seconds if a message is important or just something that you can take care of later. I am sure that all of us waste a ton of time checking our phones every time it beeps - after all the message or email or text could be important. With the Droid Turbo, you can stop being a slave to alerts since the lock screen shows you a preview the most recent messages. Now you can do a quick eye scan and go back to what you are doing knowing you are not missing anything important. This should be a feature on all smartphones! Touch-less control allow you to just speak to the smartphone and it uses Google Now to answer your questions and talk back to you. 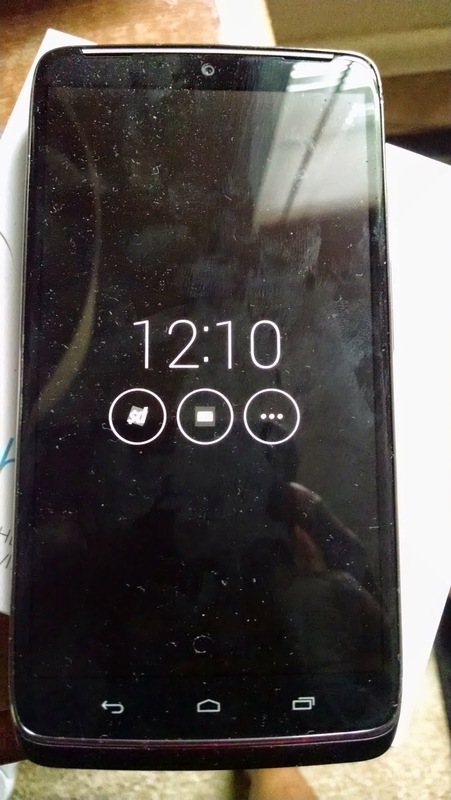 Lets say you are driving down the road and need information, but you cannot safely use your smartphone, Just say "OK Google Now" (or set your own phrase) and the Droid Turbo will wake up and ask you for a command. And speaking of driving, the Droid Turbo includes some software called "Moto Assist" that works with the touch-less control feature to sense when you are driving and will ask you if you want to take incoming calls (via speaker phone) and also read incoming text messages to you. The Droid Turbo is built with a special processor that is dedicated to the touch-less control features that work with Google Now. The touch-less control feature is always awake and waiting for your command, but will not drain your battery due to the dedicated processor. The touch-less control feature learns your voice through a series of commands so the feature will only work for you and no one else - HOW COOL! 7. Verizon Wireless 4G LTE Service is awesome! Verizon Wireless has some of the best phone service in the country. There are certain buildings where I work in Dearborn, MI where cell phone service is a problem due the how the building is constructed. But I never had a issue getting a cell signal with the Droid Turbo. 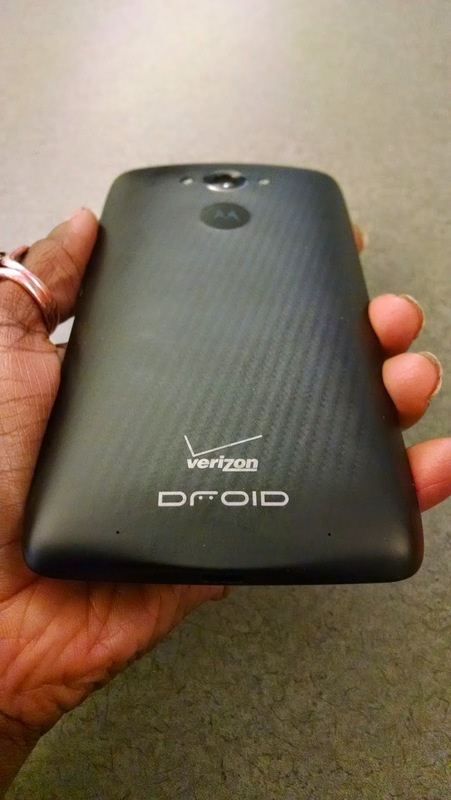 Using the feature packed Droid Turbo on the Verizon Wireless 4G LTE network was truly the icing on the cake. Overall, I give the Droid Turbo two thumbs up! - Beautiful, huge screen that makes everything easy to see and a pleasure to view. - Touch-less controls, active display, shake-to-awake camera and the turbo charger are excellent, useful features that should come as standard on all smartphones! - Tons of storage with the 32gb standard model. - The volume rocker on the side of the smartphone does not protrude out far enough which makes using it difficult. I always had to look to adjust the sound volume instead of being able to do it by touch. - Even though the camera is 21 megapixels, I really could not tell the difference between photos taken with the Droid Turbo and those taken with my 10 megapixel smartphone camera. If you are looking for an Android smartphone packed full of useful features with a beautiful screen and long lasting battery life, then check out the Droid Turbo powered by Verizon Wireless. It is truly a great smartphone. WIN Your own Droid Turbo! Want to WIN a Droid Turbo? 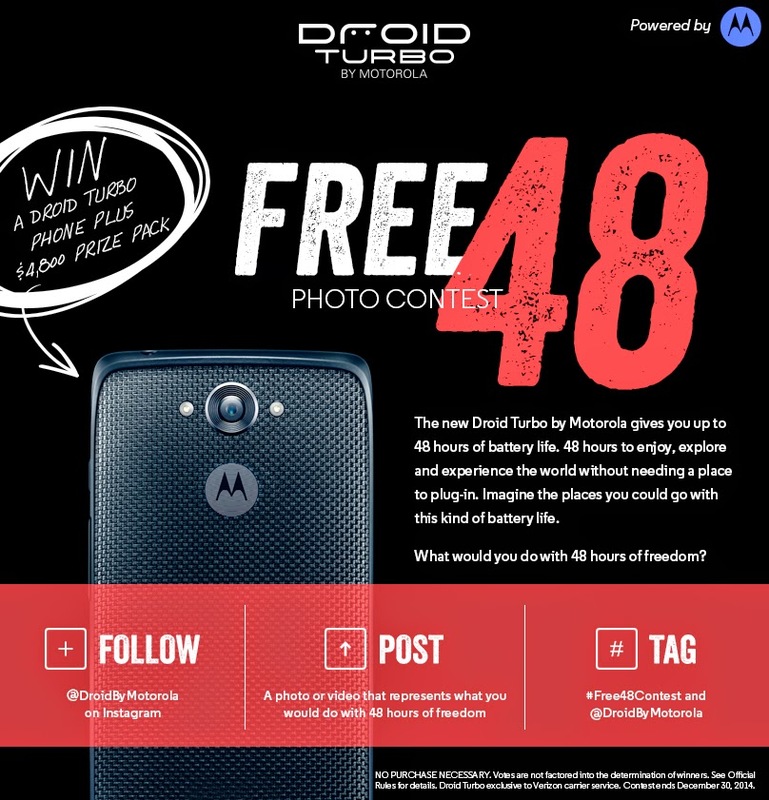 Go to the FREEISMYLIFE Instagram Account to find out the details on how Verizon Wireless is giving away a Droid Turbo as part of their #FREE48CONTEST which runs through December 30, 2014.